The scientific species name for rainbow and steelhead trout, mykiss, is derived from the local Kamchatkan (in Russia) name “mykizha”. During late winter or early spring, when water temperatures rise, the maturing adult rainbow trout and steelhead usually seek out the shallow gravel riffles or a suitable clearwater stream. Spawning takes place in the spring from late March through early July as daily water temperatures reach 6 – 9° C. The female uses her tail to prepare a redd, or nest, 4 to 12 inches deep and 10 to 15 inches in diameter. From 200 to 8,000 eggs are deposited in the redd, fertilized by a male, and covered with gravel. Hatching normally takes place from a few weeks to as much as four months after spawning, depending upon the water temperature. A few more weeks may be required for the tiny fry to emerge from the gravel. Age and growth of rainbow and steelhead trout are controlled by complex interactions of genetics and environmental conditions. The onset of sexual maturity varies markedly between individuals due primarily to such factors as food availability, population density, water temperature, productivity of the aquatic environment, and genetic makeup. In small streams, rainbow trout may spawn at 2 or 3 years of age and males often mature a year before females. Mature steelhead have generally spent 3 years in freshwater before migrating to the ocean and then another 2 years feeding in the ocean before they return to spawn. Once maturity is reached trout may spawn annually or skip a year or two before spawning again. 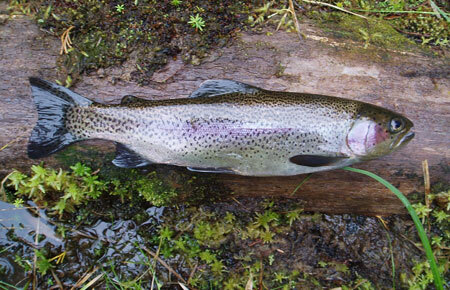 Rainbow trout up to age 11 have been observed spawning. Among resident rainbow trout, those living in or migrating to large lakes with sockeye salmon runs generally grow faster and larger than fish which remain year round in streams. When compared to the mundane habits of resident trout, steelhead have a very complicated and diverse life history. Juvenile steelhead smolt and begin their emigration to saltwater during late April through the middle of June. Once in the marine environment the steelhead grow rapidly because of the abundance of food and can grow an inch per month until they return to their natal streams as mature adults. Steelhead will have moved hundreds of miles into open ocean before returning to their natal stream to spawn. Most steelhead return after 2 or 3 years but a few may return after just one year and some not until 4 years. The oldest known-aged steelhead in Alaska is an 11-year fish from the Situk River which spent 5 years rearing in freshwater followed by 6 years in the ocean; the number of times this fished spawned is unknown. Steelhead are often grouped or classified as to the time of year they return to their home waters or natal stream, i.e., spring, summer or fall. Spring-run steelhead return to streams in Alaska between March and early June while the rare summer-run fish will return to freshwater during July. Fall-run steelhead enter the freshwater systems as adults in August through October and possibly throughout the winter. Regardless of when they return to freshwater, all steelhead spawn during the spring months when daily water temperatures reach 6 – 9° C, usually about mid-April through May to early June. Summer-run steelhead are relatively rare in Alaska and may be found in only a few select Southeast Alaska systems; annual returns of summer-run fish may vary considerably. Fall-run steelhead is the predominant form along the Gulf of Alaska west of Yakutat, including all systems on Kodiak Island and the Alaskan and Kenai Peninsulas. There are approximately 36 fall-run systems in Southeast Alaska but the spring component of these streams is thought to exceed the fall-run component. With the exception of the large transboundary rivers which originate from headwaters in Canada, the steelhead systems in Southeast Alaska all have a dominant spring-run component, even if a system has a summer or fall-run component. Steelhead are “iteroparous” and may spawn more than once while Pacific salmon are “semelparous” and spawn only once and then die. The percentage of steelhead which return a second time to spawn typically ranges from 20 to 30% but may be as low 10% or as high as 50%. Generally the larger and older females survive at a higher rate than the smaller and younger ones, and males do not survive spawning as well as females. The ragged and spent spawners, sometimes called kelts, move slowly downstream to saltwater, and the vibrant spawning colors return to a bright silvery hue as their depleted stores of fats are restored once they resume feeding. Most steelhead that spawn more than once come back annually but some may skip a year before returning to spawn. While the adult steelhead are returning to their ocean feeding grounds and their spawning wounds are healing, the eggs which were deposited deep in the gravel during the spring quickly develop into alevins or "sac-fry." These tiny fish gradually absorb the yolk sac and work their way to the surface. By mid-summer the fry emerge from the gravel, minus the yolk sac, and seek refuge along stream margins and in protected areas. Mortality of steelhead fry is high as most of them are killed or washed from the stream each year. For those that do survive they may grow to be 2 to 3 inches by the fall before heading into their first winter. These juvenile steelhead typically will spend 2 – 5 years rearing in freshwater before smolting and returning to the ocean. Given all the variables and complexities of the steelhead life cycle, including the many possible age classes, the possibility of repeat spawning, and the variation in run-timing, perhaps nature has designed the steelhead life history so that a harsh flood, winter, or drought does not severely impact a specific population. Upon emergence, the small trout fry assemble or school together in groups and seek shelter along the stream margins or protected lake shore, feeding on crustaceans, plant material, and aquatic insects and their larvae. Resident rainbow trout rear in similar habitat for the first two or three years then move into the larger water of lakes and streams and turn more to a diet of fish, salmon carcasses, eggs, and even small mammals. After they smolt and enter the open ocean, steelhead grow to be significantly larger by feeding on more nutritious squid, amphipods and other fish. There is little information on the migration of Alaska steelhead away from our coastal waters to the open ocean. Steelhead are most abundant in the Gulf of Alaska and the eastern North Pacific and western Aleutian areas and generally found in the 50 C isotherm in the north and the 150 C zone in the south. When high-seas drift gill-netting was occurring large numbers of steelhead from the Pacific Northwest streams and Alaska were intercepted in this fishery; this indiscriminant fishing is no longer allowed. One anecdotal piece of the puzzle comes from a steelhead tagged in 1989 as it left the Karta River in Southeast Alaska. This fish was recaptured about 3 weeks later by a Japanese research vessel on the high seas of the Pacific Ocean. Rainbow trout are native to waters throughout Southeast Alaska west to Kuskokwim Bay, and as far up the Kuskokwim River as Sleetmute. The clearwater lakes and streams draining into Bristol Bay provide outstanding habitat. Rainbow trout occur naturally on the Kenai Peninsula, throughout the fresh waters of Upper Cook Inlet, on Kodiak Island, and in the Copper River drainage. Release of hatchery-reared rainbow trout outside of their native range has occurred in specific lakes and streams in the Tanana River drainage near Fairbanks, Kenai Peninsula, Kodiak Road System, Matanuska Susitna Valley, Prince William Sound, Resurrection Bay, Anchorage Bowl Sub-District, Chugiak/Eagle River Sub-District, Elmendorf Air Force Base Sub-District, Fort Richardson Army Base Sub-District, and the Turnagain Arm Sub-District. Steelhead are found in the coastal streams of Alaska from Dixon Entrance northward and west around the Gulf of Alaska down to the Port Heiden and Cold Bay area on the Alaska Peninsula. There are no documented populations of steelhead on the Alaska mainland west of the Susitna River and north of the Chignik River system. This area is generally known as Bristol Bay and the populations of rainbow trout in this area do not migrate to sea and are considered resident rainbow trout. Alaska is unique in that it relies primarily on wild propagation of steelhead populations versus the lower 48 states where a majority of the steelhead populations are enhanced. Wild populations of rainbow and steelhead trout in Alaska are generally believed to be healthy with only a few specific areas where fisheries managers are concerned. This is not the case elsewhere as both native rainbow and steelhead trout are considered threatened or endangered throughout most of their native range. The way to maintain healthy populations of trout in Alaska is to ensure that their habitat is preserved. Based on the limited stock status information available, steelhead abundance in Southeast Alaska was relatively stable and slightly above average between 2003 and 2007 but has trended downward in recent years, closer to the 15-year average. There are still systems in Southeast Alaska that have not rebounded from the depressed levels observed in the late 1980’s and early 1990’s. Very little information is also available for steelhead stock status and trends throughout South Central Alaska but the populations are thought to be fairly stable with managers concerned with the number of returning adults to a few streams. Environmental changes in the North Pacific Ocean affect the survival of juvenile steelhead as they mature, thus impacting the number and size of returning adults. 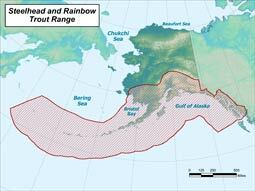 Rainbow trout populations in freshwater are also thought to be stable throughout their native range in Alaska. The biggest threat to rainbow and steelhead trout in Alaska is the degradation of their native habitat caused by human interactions and development including: urbanization, roads, hydroelectric projects, timber harvest, mining projects, and loss of wetlands. Threats include habitat loss, habitat degradation, climate change, sport, subsistence and commercial harvest. The Alaska state record for rainbow and steelhead trout is 42 lbs 3oz and was caught at Bell Island in 1970. Rainbow, steelhead, and cutthroat trout were at one time classified or grouped by scientists with Atlantic salmon but are now grouped with the more closely related to Pacific salmon species. Unlike salmon which die after spawning, rainbow and steelhead trout are “iteroparous” which means they may return to spawn several times. It is important for anglers to handle rainbow and steelhead trout carefully because many of them will return in future years to spawn again. Nearly all of the rainbow and steelhead trout caught and released by anglers will survive if handled properly. Rainbow and steelhead trout are harvested in the marine and fresh water sport fisheries and the state and federal subsistence fisheries. Steelhead are also harvested incidentally in the commercial fisheries. The rainbow and steelhead trout sport fisheries are two of the most popular freshwater sport fisheries in Alaska. The average annual Alaska sport rainbow trout catch estimate from 1999 to 2008 was 773,000 rainbow trout. During that time period, 84% percent of the catch occurred in Southcentral Alaska. On average, 83,000 rainbow trout were harvested annually in the sport fishery from 1999-2008. The average annual Alaska sport steelhead catch estimate from 1999 to 2008 was 30,000 steelhead of which 60% of the catch occurred in Southeast Alaska and 30% from Southcentral Alaska. On average, 432 steelhead were harvested annually in the sport fishery from 1999-2008. Under the federal and state subsistence fisheries, subsistence harvest of rainbow and steelhead trout are allowed, but only in designated areas. Comparatively to salmon, fewer rainbow and steelhead trout are harvested in the state and federal subsistence fishery. Differences in harvest levels from year to year are influenced by a number of factors including freshwater and ocean survival, weather, economic and travel considerations, and the level of harvest of other resources. In Alaska, rainbow and steelhead trout fisheries are managed to ensure sustainability and to maintain the diversity of recreational angling experiences. Daily bag and size limits are intentionally conservative to preserve wild rainbow and steelhead trout. Artificial lure-only regulations are commonly used to reduce angling mortality, and some waters have been designated as catch-and-release or trophy fisheries only. Anglers who wish to take rainbow primarily for the pan are encouraged to visit one of the hundred or more lakes stocked annually with Alaska rainbow trout. Throughout Southeast Alaska the large minimum size limit for steelhead means that most of the steelhead caught will subsequently be released and anglers are encouraged to practice proper catch-and-release techniques to help protect and preserve this highly sought after and dynamic sport fish. The State of Alaska monitors recreational rainbow and steelhead trout harvests through mail surveys, logbooks for the charter recreational fishery, and on-site sampling for biological and fishery characteristics. The United States Forest Service monitors subsistence harvests by compiling reported harvest on returned subsistence permits. There are a number of ways to get involved in the regulatory process for rainbow/steelhead trout. Since rainbow/steelhead trout are managed by the State of Alaska you may get involved by attending Alaska Board of Fisheries (BOF) meetings, local advisory committee meetings or writing proposals to the BOF. The Board of Fisheries meets four to six times per year in communities around the state to consider proposed changes to fisheries regulations. The board uses the biological and socioeconomic information provided by the Alaska Department of Fish and Game, public comment received from people inside and outside of the state, and guidance from the Alaska Department of Public Safety and Alaska Department of Law when creating regulations that are sound and enforceable. Proposed changes can be submitted by the general public. The public is invited to comment on proposals prior to deliberation through written or oral means. The public is also encouraged to participate in their local advisory committee. There are 81 committees throughout the state that provide recommendations to the BOF on a variety of issues. For more information see: Board of Fisheries. More information on getting involved in trout resources may also be found at Trout Unlimited.